The electric hand router -- if you can operate a 60-pound tool by yourself -- has been around for over a century. 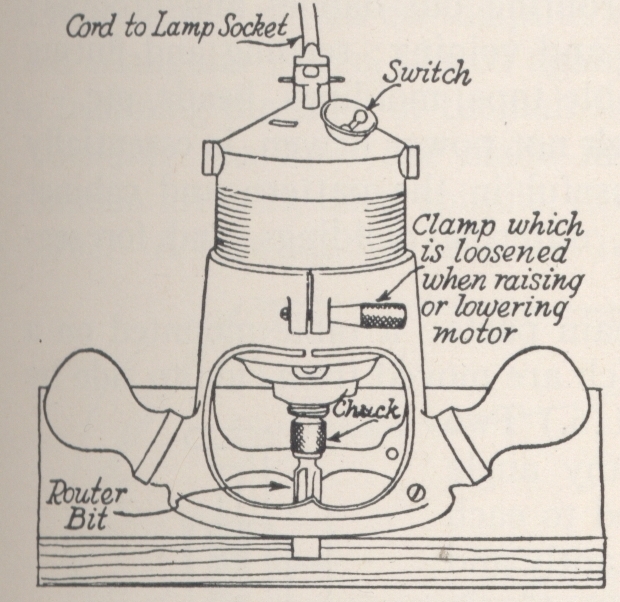 As early as 1905 the first commercially produced router -- three phase -- was marketed by the Kelley Electric Machine Co. of Buffalo, New York. That firm -- incorporated with an capitalization of $25,000.00 in October of 1908 -- had three directors: Guilford W. Franicis, W. Morse Wilson, and George L. Kelley. Source: New York Times, October 24, 1908, page 12. "Given the purported 1906 genesis of the Kelley Electric Machine Co., router", Keith Rucker speculates, "it is likely that Stevenson Machine Co. is a predecessor of Kelley Electric Machine Co."
Weighing sixty pounds, it is over 12" in diameter and 16" high. Keith Rucker -- www.owwm.com -- notes that advertisments in the Wood-Worker between 1911 and 1929 shows their "Kelley Router" - a handheld router that looks to be at least twice the size of any hand-held router available today. The bit rotates at 6500 RPM, roughly the slower speed of my two-speed shaper. Rucker notes that an advertisement in a 1920 issue of Wood-Worker claims that Kelley has sold their router for fourteen years, a date which confirms their appearance at about 1906. Kelley's patent claims that it is a "portable routing machine for working wood". Portable -- i.e., sixty pounds! ("portable" -- in those days defines differently than today -- means that it can be "moved about" and "used on work benches, or elswhere, where the work can be done to the best advantage". Also specified is that the machine can be operated "rapidly" and "accurately" by "unskilled labor". This machine, the patent's text continues, "is capable of a great variety of uses", including "cutting regular and irregular grooves or channels of different dimensions and shapes in the surfaces of boards". This machines is, especially, "suited to cutting grooves for stair stringers to receive the risers and treads". The innovation that Kelley's router achieved: revolutionize the method of cutting grooves for stair stringers. 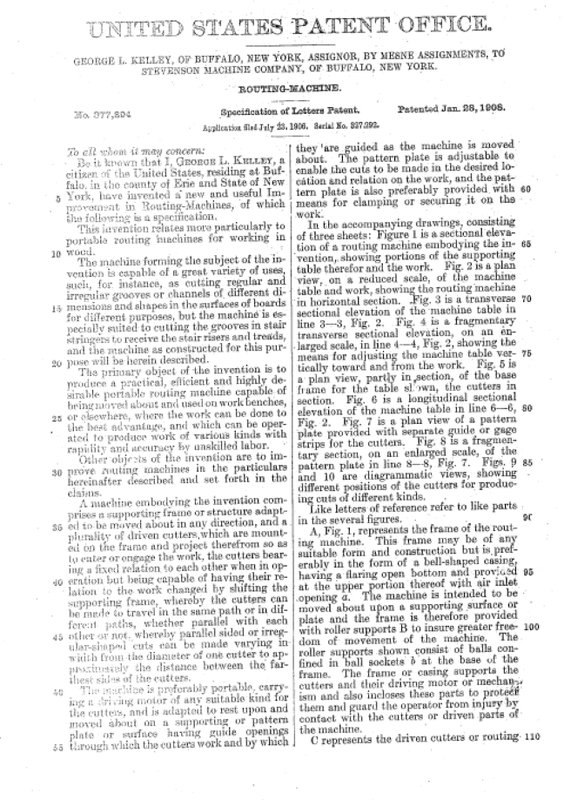 Mobile, the machine can be "moved about in any direction" and can be fitted with a "plurality of driven cutters"
The pattern plate is adjustable to enable the cuts to be made in the desired location and relation on the work, and the pattern plate is also preferably provided with mens for clampling or securinig it on the work. Pretty heady stuff for 1908! 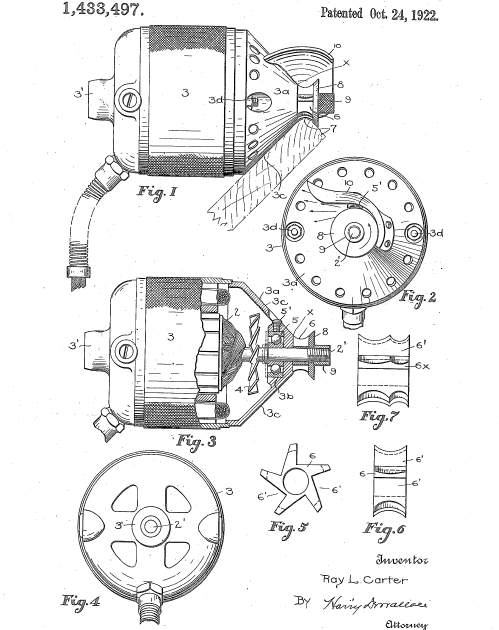 With patent # 931,552, William H Ahlers, a Kelley associate, "invented a new and useful improvement in guide devices for routing machines". This invention relates to guide devices for routing and analogous machines -- more particularily, directly on the router, patent no 877,894. These machines, again, are "portable" and their operation can be guided by a mechanism that supports their cutters directly over the wood being cut. 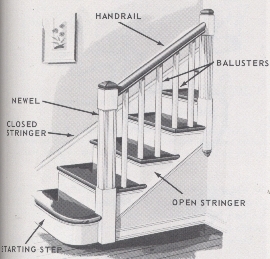 The patent also notes that the primary function of the router remains dadoing grooves on stair stringers -- see images of stair stringer, risers and treads above -- to receive stair risers and treads. This patent creates improvements in routers which allows the creation of grooves for stair risers and treads of different thicknesses. Although the Kelley router is very crude and heavy, it becomes the revolutionary development for the wood-working trades; especially the furniture and architectural millwork industries. The router eliminates tedious hand carving and makes correct geometrical cuts. "... for fluting columns and pilasters (Kelley's) machine cannot be beat." Kelley's advertising motto boldly read, "Clean finished cuts in straight or cross grain." Around 1914, Carter routers, manufactured in Phoenix, New York, appear and quickly earn the designation of "Wonder Tool." They are considerably smaller than the Kelly routers, but their 1 1/2 H.P. model still weighs 35 pounds. Carter routers feature a threaded motor housing, depth adjustment system and many other features that are essentially still the same as found on some present day routers. Edge guides, base mounted template guides, D-handles, bits from 1/16" to 1" are likewise similar to those available today. Carter patents a dovetail template system in 1927, but records show an earlier patent is granted in Germany for a dovetail system in 1906. Stanley Electric Tools purchases the Carter line in 1929 and produces routers through the decades until the company is sold to the Bosch Tool Corp. in the early 1980s. A search of the books in Google Books search shows only one hit, and that very obscure. The "hit" is the magazine, Industrial Education, on page 32, but the date is not given, although from the evidence of the "snippet", view, it is the 1920s. In the snippet from Industrial Education, the label for the "router" is Carter Hand Shaper. CHS is the name given in "tools for sale" sections of 1930s newspapers, suggesting that the popular name for this first router is "Carter Hand Shaper". Application filed April 17, 1922. Be it known that I, Ray L Carter, a citizen of the United States, residing at Syracuse, in the county of Onondaga and State of New York, have invented certain new and useful Improvements in shaping Devices, of which the following is a specification. This invention relates to shapers, designed for use by. pattern-makers, cabinet-makers, carpenters and the like, and has for its object. to provide a novel and simple device of the class for rounding and bending the corners of patterns and various other wooden articles. A further object is to provide a light, easily portable shaper, consisting of a hollow casing which encloses a high-speed electric motor, on the armature shaft of which may be mounted rotary cutters of various types, by which the corners and edges of wooden articles may be given different shapes, in a ready and quick manner. 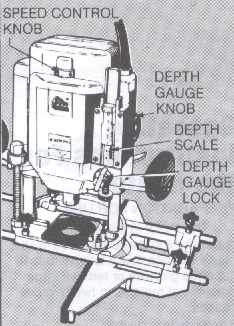 A further object is to provide a relatively small and light shaper of the class, which may be held and operated by one hand, said device being equipped with a conical head by which the device is guided and being provided with novel adjusting means for taking up looseness, as well as for facilitating the employment of cutting tools of different size. In 1929, the Carter line Stanley Electric Tools purchased and produced routers until the company was sold to the Bosch Tool Corp. in the early 1980s. The image on the left is a pen-rendering. Source: Principles of Woodworking Herman Hjorth, Milwaukee: The Bruce Publishing Company, 1930, page 47. Notice the claim, "for the home workshop". 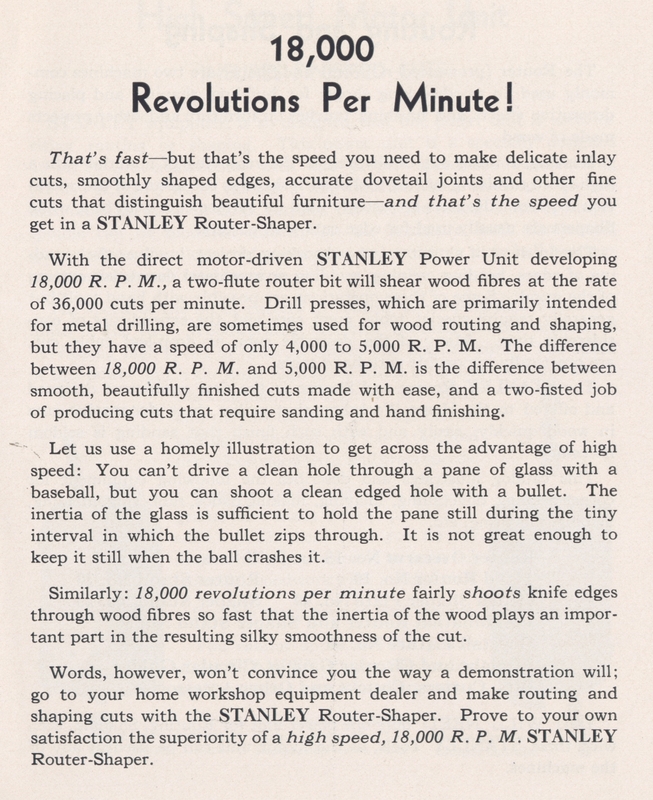 Scan of page 5 from the catalog (below)gives you an idea of how "revolutionary" 18,000 Revolutions Per Minute! the hand-held router would be for any woodworker -- professional or amateur alike! 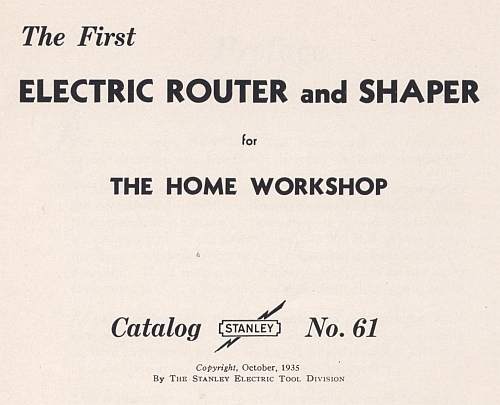 On the left, the title page of the attractive 29 page, 1935 Stanley-Carter Router-Shaper Catalog. On the right is the same Stanley router, this time in Herman Hjorth's 1937 manual, Machine Woodworking Milwaukee: The Bruce Publishing Company, 1937, page 190. Rather than manufacturing their own units, from 1948 until 1950, Porter-Cable simple puts their nameplate on the Unit tools. Unit Electric manufactured two models of routers. In 1950 Porter- Cable introduces their own design, the model 100, a model that Porter-Cable produces until 2006. Using the label, Guild, Porter-Cable introduces a line of accessories, including components for converting the router into a portable plane or a bench top shaper. On the left is a fragment from an advertisement in the San Antonio Light 11-14-1950. The occasion evidently includes a factory representative demonstrating the tool. Notice that Porter- Cable calls the router the "Guild Power Router". From evidence located in the newspaper-archive. com, Porter-Cable advertises heavily -- this advertisement is typical -- throughout America immediately following WW II. Outside of the newspaper-archive.com database, the results of searches for evidence of routers in the 1940s is disappointing. For example, for the 1940s decade, the Reader's Guide to Periodical Literature yields no relevant hits on routers. (While the RG is only one of a handful of indexes that cover topics of technology in this era, the lack of hits in it indicates that, as a topic, routers are not important tools in this decade. How do we know? The RG that indexes "selected" articles -- but not every item -- published in issues of titles such as Popular Science, Popular Mechanics, Industrial Arts Magazine and Industrial Arts and Vocational Education. . What this policy means is that brief news notes -- which might include news of a new router on the market -- are ignored by the indexers of RG. ... 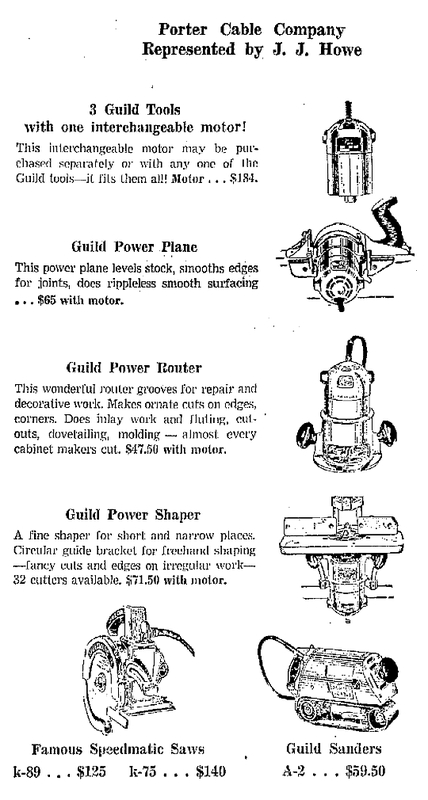 The Guild model 1100 was one of whole line of power tools Porter-Cable produced under the Guild brand. Although its dome-topped motor housing doesn't lend itself well to bit changes—it won't stand on the bench upside down—its visual attractiveness still pleases woodworkers today in the modernized form of the Porter-Cable model 100. In 1950, Porter-Cable introduced the Speedmatic line. 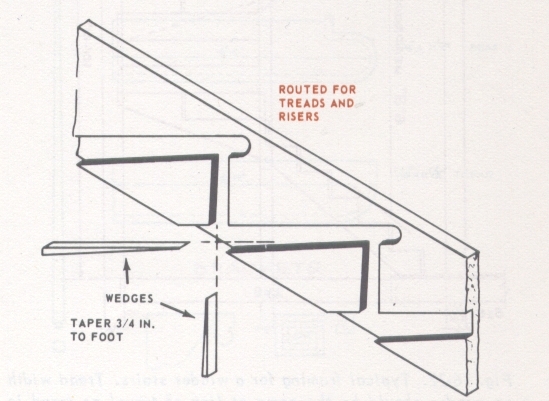 Additional evidence that routers are not yet considered tools in the homeworkshop comes from the scant treatment they receive in several woodworker's manuals of the late 1940s. In the history of the use of routers by amateur woodworkers, Herman Hjorth's article, "The Router", is a sort of breakthrough document. Its appearance in the last issue of the November-December, 1949 issue of Home Craftsman puts it just inside that historic decade when America fought in World War II, and just two years before Hjorth's death in 1951. "The router machine in its heavy-duty production form is a type of machine that mostly resembles a drill press." To demonstrate, Hjorth includes an image of the production router, reprinted above. and many molding cuts can be made easily with the hand router and pilot tip bits. In other words, the hand router, consisting of the motor, router base and guide, can be used for making almost any cuts required in joinery. The "hand router", though, is the main focus of Hjorth's article. That it was written in the late 1940s is, I think, telling, as hand-held routers, themselves, come into the market late in the 1920s, and are not purchased by amateur woodworkers until the 1940s. My evidence on the last statement comes from an investigation of entries in the Reader's Guide to Periodical Literature, the New York Times, and the www.newspaperarchive.com. 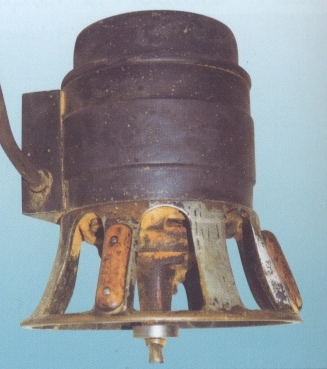 The hand router, more familiar to the home craftsman or the shop owner doing light production work, is primarily a motor held in a base provided with two knobs. ... [A] versatile machine [it] can not only bore holes, ... make mortises, cut grooves for inlay lines and insets, cut rabbets, cut gains for hinges, make dadoes, groove curved work, bead and round small moldings, and do veining and routing after templates. With ... a jig and fixtures ... the hand router can be used to cut dovetail joints, bead and flute turned legs. With a ... [Stanley-made fixture you convert] a hand router into a shaper. With the aid of a router stand, the hand router becomes a bench router similar to the heavy-duty production router. 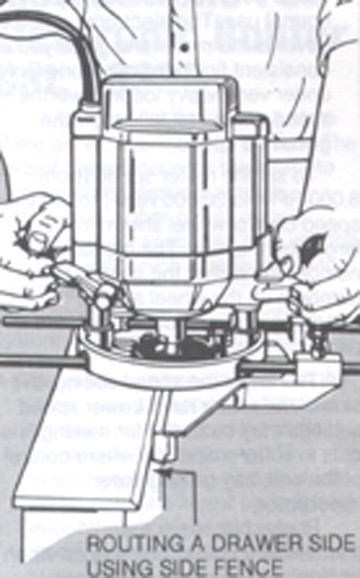 The hand router motor can be raised or lowered in the base, thereby controlling the depth of the cut. The base also has a reversible guide fastened to two steel bars. One side is flat and used along straight surfaces; the other has a depression in it and is used for cutting along curved surfaces. Sources: Herman Hjorth, "How to Operate Power Tools", Home Craftsman 18 1949, pages 18-21, 55-58; reprinted as chapter 12 in Milton Gunerman, How to Operate Yor Power Tools New York: Home Craftsman Publishing Corp., 1950. 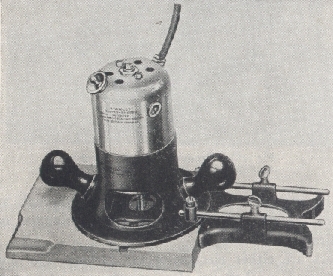 Germany's Elu firm develops the plunge router in 1949. Soon, Elu routers become known throughout the world as the best plunge routers, basically setting a standard for all other plunge routers. Interest in plunge routers in America, however, emerges much later; in the early 1980s, Elu is purchased by Black and Decker, who also owns DeWalt Industrial Tool Co. The plunger router eliminates the "threaded housing"/base plate operation of setting the depth of cut by the rotating bit. (See threaded housing on anatomy of router above.) This feature introduces both greater accuracy and safety. Today, the Elu/DeWalt plunge routers are still made in Europe and are direct clones of the famous Elu plunge routers. Elu fixed base routers are made in the United States. Otherwise, distribution of Elu brand routers in the U.S. has been discontinued.